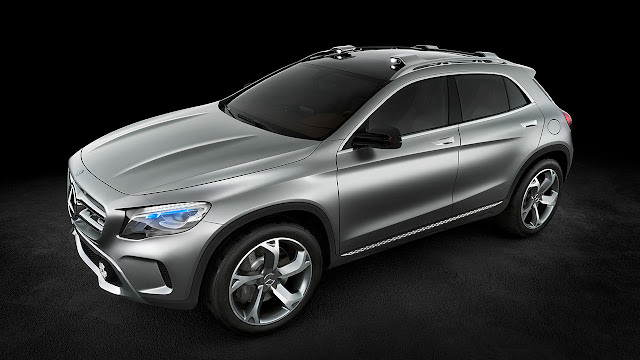 Mercedes-Benz is showing a compact premium-class SUV at the "Auto Shanghai" motor show in the form of its Concept GLA. 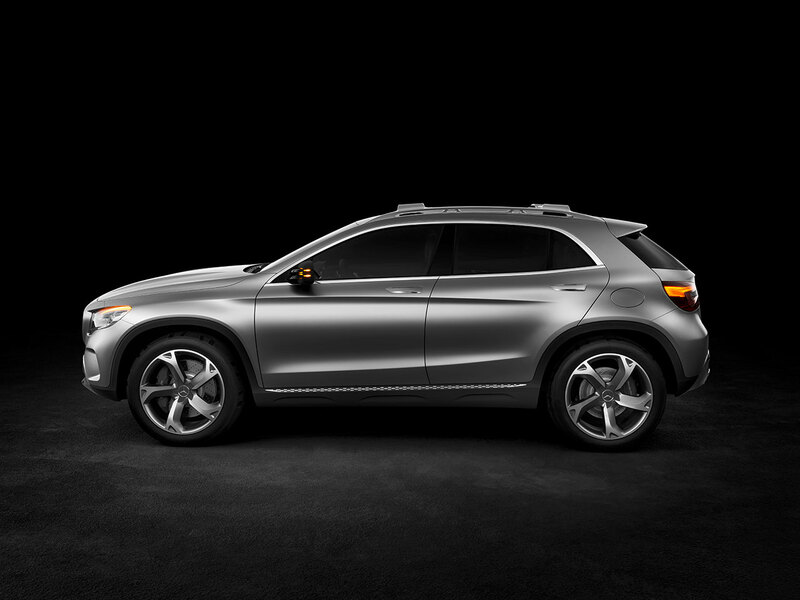 The Concept GLA combines dynamic styling with clear benefits for recreational use. Under the bonnet of this new concept vehicle (length/width/height: 4383/1978/1579 millimetres) sits a four-cylinder turbocharged petrol engine rated at 155 kW (211 hp) with a displacement of 1991 cc. 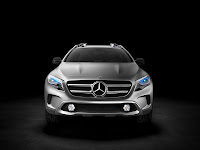 Its power is transmitted to the road via the 7G-DCT dual clutch automatic transmission and 4MATIC all-wheel drive. A new approach is taken here in the form of headlamps featuring laser technology: these not only shine more light on the road, but also function as projectors. 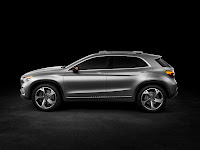 "The Concept GLA marks a new approach for us in the compact SUV segment – this is a sporty and more coupé-like evolution of this category of vehicle", commented Dr Joachim Schmidt, Executive Vice President Mercedes-Benz Cars, Sales and Marketing. "The Concept GLA is a compact SUV that combines its sporting spirit with the all-round qualities of a tough, leisure-time companion. 'Escape the everyday' is the message that this car conveys to its driver. It also makes clear the further potential of our compact vehicle architecture, which provides the basis for the A- and B-Class models that led the German market in their respective segments in the first quarter of 2013." Clear evidence of the innovative thinking on the part of the designers that has gone into this concept vehicle is provided by a number of distinctive features. These include the powerful bonnet with its powerdomes and a sporty radiator grille with centrally positioned star. The new-style surround to the star merges elegantly into two horizontal bars. Likewise new are the so-called "softcubes": these are soft, raised pads that help to give definition to the radiator grille and are also to be found on the side sill panels and alongside the exhaust tailpipes. The distinctive door mirrors, with their twin supporting struts, are fitted with a protective grille. This, like the underride guard at the front, is very much a typical SUV feature. 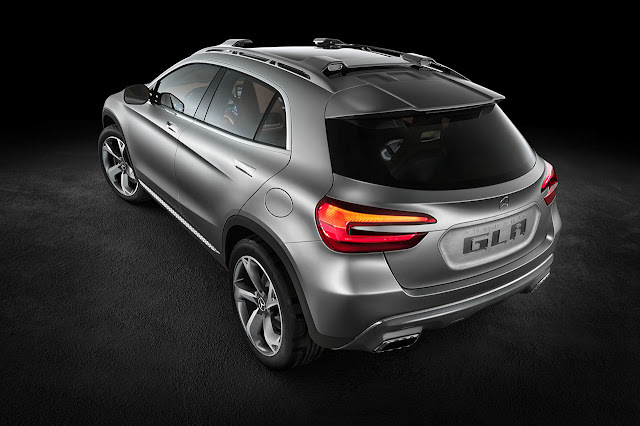 The striking appearance of the Concept GLA is also, not least, the result of its silver Alubeam paint finish. 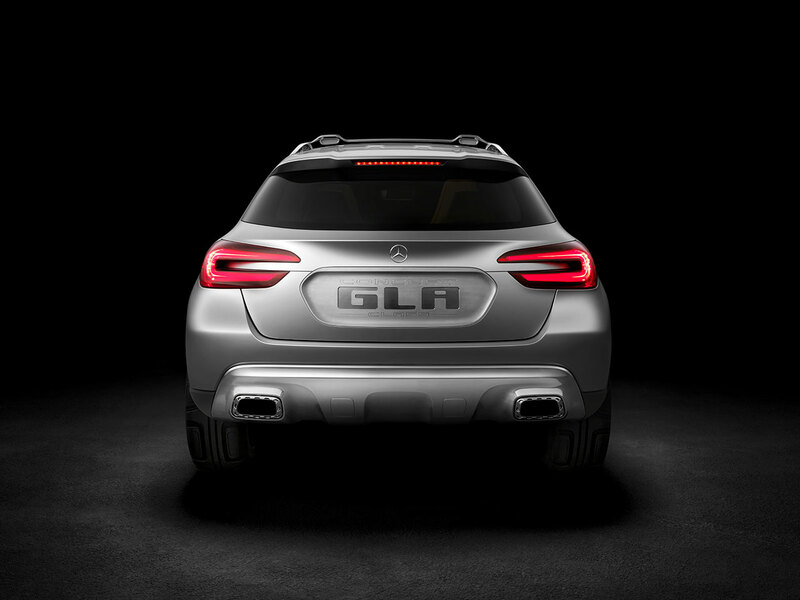 Seen from the side, too, the Concept GLA conveys a sense of power and confidence. This reinforces the overall design philosophy behind the vehicle with a "dropping line" that extends from the headlamp to the rear wheel arch. The beltline trim rises slightly from the rear door towards the C-pillar. Together with the light-catching contour formed by the curvature of the vehicle flank and the line that rises from the level of the door sill towards the dropping line, this creates a unique interplay of lines that adds to the sense of elegant dynamism. The slim door handles of the five-door vehicle are fully recessed, emerging at the touch of a button. The frameless side windows also emphasise the coupé characteristics of this concept vehicle. The 20-inch wheels, with their distinctive five-spoke turbine design, are shod in size 255/45 R 20 tyres. These have been specifically created for the Concept GLA: their tread pattern continues the lines of the spokes in an optical illusion that makes the latter appear longer. The muscular haunches above the rear axle, accentuated by the way the C-pillar is pulled in slightly, extend to the rear over the light clusters, so also emphasising the broad stance of the tail end. The outcome is a powerfully taut arc that nevertheless avoids aggression. This impression is reinforced by the curvature of the rear window and the elegant chrome strip between the rear light clusters. The large roof spoiler is a further eye-catching feature. This follows through very neatly on the structure of the rear roof panelling and provides the housing for the additional brake light. 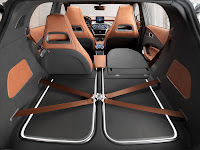 Further SUV references, such as a load sill guard and a concealing underride fascia panel, are to be found in the area of the rear bumper covering. The twin-pipe exhaust system is evidence of the car's sporty aspirations. The tailgate features a power closing system that allows it to be opened or closed at the touch of a button. Opening the tailgate with its integrated rear light cluster reveals supplementary lights to warn approaching vehicles of the open tailgate. Further light clusters are housed in the rear cross member between the roof rails. 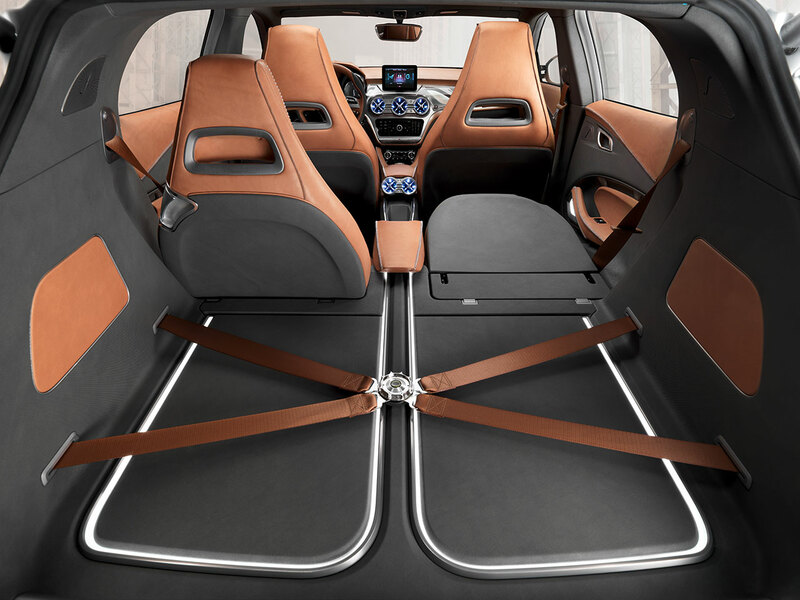 In terms of its design, the interior reflects a clear alignment with the interiors of the other new compact Mercedes models, reinterpreted here for a sophisticated and exceptionally high-quality SUV. It is dominated by an exciting juxtaposition of leather and dark galvanised aluminium. 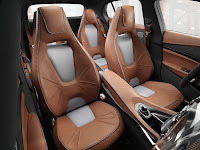 The four individual seats and the door centre panels are upholstered in natural leather in a rich shade of brown. Both colour and workmanship bring the image of a saddle to mind: all in all, the Concept GLA incorporates more than 20 metres of hand-stitched seams to hold the raw edges of the leather together. The seat cushions, which feature central inlay panels in a high-quality canvas material, display an embossed pattern that continues the saddle theme. An illuminated insert is set into the integrated head restraint of each of the four sports seats. Grey leather with a graphically applied grain is used on the backs of the front seats, amongst other places, and continues the idea of patterns being continued over from other surfaces. The armrests and centre panels of the door linings are designed as a very clear structural unit. The instrument panel is constructed in several layers. On top of a leather-upholstered surface sits a framework in a combination of matt and polished aluminium, which provides the necessary support for all the instruments. This is held in place by clearly visible screws, featuring a specially devised design. This unit is protected from dust and dirt by a plexiglas covering that is illuminated from behind, so adding to the impression that the different levels are free-floating. The control buttons for COMAND Online have also been crafted with meticulous technical precision. They are made of plexiglas and painted from the back in black. Pictograms are then etched into the black, also from the back, before being filled in. The air vents in the instrument panel as well as in the rear represent a further stylistic development of the vents used in the Concept A-CLASS and Concept Style Coupé, and are likewise illuminated from behind. They change colour according to the interior temperature set by the occupants. At a temperature of 22 degrees Celsius they light up in white. If a cooler temperature is selected for the interior, they turn blue, while opting for an influx of warm air switches the illumination to red. Fibre-optic ambient lighting in the load compartment visually extends the line drawn by the centre console all the way from the instrument panel through to the rear seats. A rectangle of lighting strip inset into the load compartment floor serves to highlight its level surface. Luggage can be secured firmly with a spring-loaded four-point harness, as used in helicopters. A simple handle is used to fold the backrests of the rear sports seats forward to create a level load compartment floor. Film time! 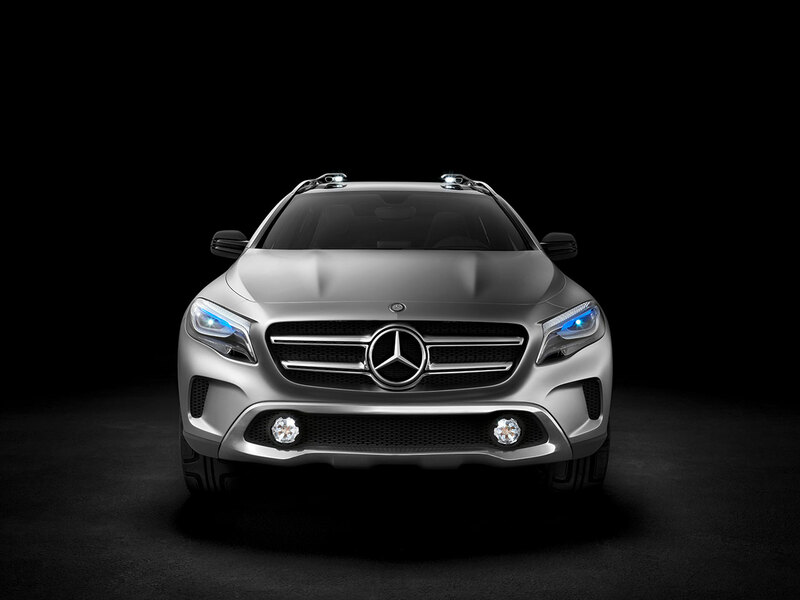 The front headlamps of the Concept GLA are each fitted with a laser-beam projector. These not only provide the light to drive by, but are also capable of projecting pictures or films onto a screen or other surface. Any format that can be operated through COMAND Online can serve as a source: pictures or films from a smartphone, the internet, or from a hard drive. Alternatively, the action can be produced live. 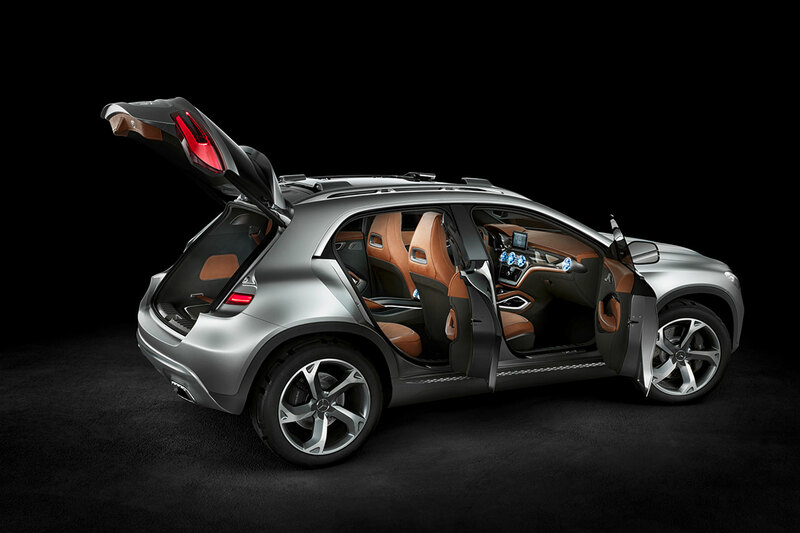 The Concept GLA is fitted with two cameras, housed in the front roof rail. And these can be used for far more than just 3D images taken as the Concept GLA drives along: the HD cameras can be removed and, for example, fitted to a mountain bike helmet. An additional lamp unit in each camera ensures that the lighting is right, whatever the situation. As an alternative to the projection option, films may also be viewed inside the car on the COMAND Online screen. The laser-beam projectors represent far more than simply an academic exercise on the part of the engineers and designers at Mercedes-Benz. As a further enhancement of the head-up display, they could also help to improve road safety: the technology could be used, for example, to project the directional instructions from the navigation system onto the road in the form of arrows – in this way other road users, too, would be able to see where a driver is heading. It is not only the laser-beam projectors and their visible cooling system provided by rotating vents that make the shimmering blue headlamps of the Concept GLA such an interesting feature. With the "Coming home" function, the blue light begins to pulsate to indicate that the vehicle is ready and waiting for its driver. While the driving lights are produced here for the first time by a laser beam reflected off a mirror lens, the daytime running lamps, with their characteristic "torch" effect, as well as the indicator lights, consist of LEDs. The indicators take the form of digital chase lighting strips and, as such, represent a further development of the "Mexican wave" design used on the Concept Style Coupé.